The Honda CFR250L has landed, with a chance to win! The Honda CRF250L has now landed in Honda dealerships. 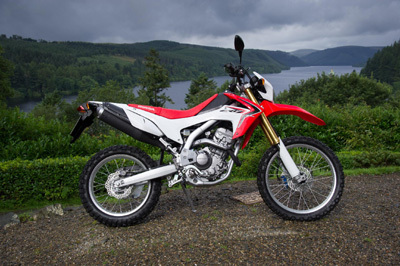 Priced at £3,950 the CRF250L re-ignites the trend for road-legal, off-road machines, following on in the tracks left by the much respected XL250 and XR400. The CRF250L’s slim, compact frame offers perfect control on uneven off-road trails and makes it easy to tackle tight, urban spaces when commuting. It is the latest result of the Honda’s long history and expertise in both off-road competition and dual purpose machinery, creating a machine that is equally at home on city streets or in country spaces. Its dimensions, ergonomics, low weight, long-travel 43mm Showa USD forks and Pro-link rear suspension are suited to a wide range of terrains and riding conditions. Powered by a Liquid-cooled 4-stroke DOHC single cylinder 250cc engine, the CRF250L provides useable power and torque across a wide rev range, with excellent efficiency and fuel economy. The CRF250L takes many styling cues from the legendary CRF competition range – edgy and purposeful. The new machine, developed from a global viewpoint, offers outstanding value for money, combined with Honda’s renowned build quality and a taste of true competition pedigree. To celebrate the launch of the CRF250L, we're giving you and a friend the chance to win a VIP weekend in Belgium. Enjoy a meal in the luxury surroundings of your 4* hotel before heading out for a thrilling VIP experience at the Motocross des Nations. To find out more about your chance to win, visit hondamc2013.com.